Rose bushes need protection from winter weather so they will continue producing again next season. During the cold months, the rose crown and roots need to be insulated from the cold ground and from the possible winter thaws and re-freezes that can occur. Preparing a rose for the winter months begins the spring before, since a well-tended, healthy plant will be able to withstand the worst conditions much easier. Water your rose bush adequately throughout the growing season. Allow the soil to dry down to a depth of 2 inches before watering. Water your rose bush two to three times weekly, possibly more in warmer weather, and use a soaker hose or irrigation system for deepest watering. Continue watering the rose bush until the ground freezes, then stop for the winter, resuming after the last frost has passed. 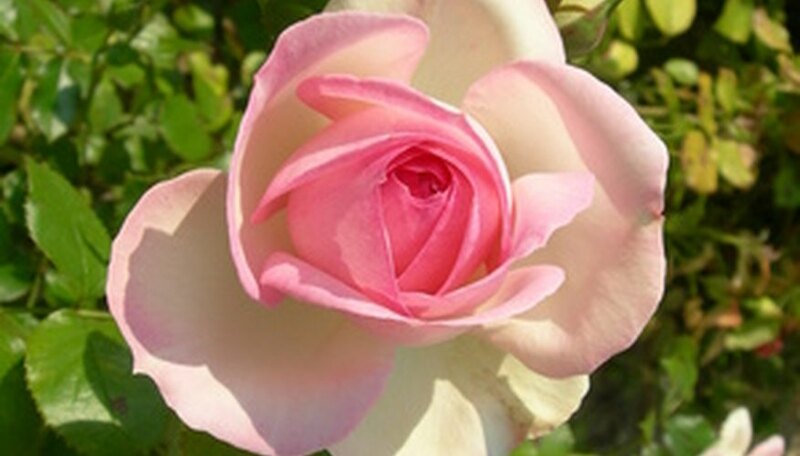 Fertilize the rose with a high-phosphorus rose food, such as 5-10-5, every month during the blooming season. Discontinue fertilizing in late August to prepare the rose for winter and so that no new growth is forced that may not survive the winter months. Prune the rose bush throughout the growing season by removing spindly growth and diseased or damaged canes, and deadheading -- or removing spent blooms -- frequently to keep the plant strong and healthy. Stop cutting off the dead blooms in late September as a signal to the rose bush that it needs to go dormant. Remove all the dead leaves in late fall or after the first frost. Once they have fallen off, rake them up from around the bush to keep pests from hiding in there during the winter. Apply a dormant spray or oil after a couple hard frosts, which discourages pests and diseases from lingering on the rose bush through the winter. Purchase dormant spray or oil at your local gardening store. Apply a 3- to 4-inch layer of straw, chopped leaves or any other type of mulch about 12 inches around the base of the rose bush. Add a few inches of soil on top of the mulch to further insulate the roots. Wrap the entire plant in a burlap bag, packing straw inside it. Secure the bag with twine or clips to keep it from coming off the plant. Uncover roses in early spring after all danger of freezing conditions has passed. After the winter has passed and the rose has been uncovered, water deeply if the soil is dry and prune back the canes to one-third of their length. For a climbing rose, untie the canes from their supports in late fall and gently lay them on the ground; cover the canes with 3 to 4 inches of straw and a few inches of soil to insulate. At What Temperature Should Rose Bushes Be Covered to Protect Them From Freezing Weather?